Francesco Pianeta played his part, the 250-pound piñata for birthday boy Tyson Fury’s party. He took his cheque and plodded home safe and well as Fury confessed he hoped he would. Pianeta seemed happy enough. Undamaged, paid and with a tale or two to tell his grandkids. It says much of the heavyweight division we’ve endured this past 10 years that the gallant, if parsimonious, German pug once fought for the title. But then Joe Louis fought bums too. With the party complete, and with the piñata not opened up in the way one might imagine the Brown Bomber would’ve done following a similar two year absence, Fury’s big present was revealed. The sense of surprise had long since been lost, which in a sport capable of high theatre, but too often reduced to pantomime, was an opportunity squandered. In truth, a 6ft 7inch black man, with long limbs, Alabaman vowels and gregarious tailoring is a hard thing to hide in a rain soaked Belfast so perhaps I expect too much. Vested parties opted instead for Youtube hits, exposing him to the public at every opportunity and employing Billy Joe Saunders as the quarry to Wilder’s Benny Hill to capture the viral market too. Wilder is an affable man, and uncomfortably positioned between sellable personas, lost in a maze of misdirections and false starts he hasn’t captured the hearts of the American market in the manner his forebears Tyson and Holyfield did but he isn’t the ‘unknown’ champion Matchroom Sports would encourage you to believe he is either. While the Wilder brand still needs work, he does possesses the most devastating single punch power in the division. Admittedly, it is coupled with the most hollow record since Vulfpeck’s Sleepify concept album of 2014 but he is unquestionably a dangerous man. On the evidence of Saturday night’s fight, despite the creative notions put forward in commentary by David Haye who suggested Fury was ‘holding back’ so as not show his true capabilities to the watching American, Fury has much to do between now and the proposed November date if he is to circumnavigate the threat Wilder poses. Despite misgivings about Fury’s readiness, both fighters need to be applauded and respected for making the match. After all, if we admonish those who protract the negotiations and grow frustrated with those who protect zeros and marinate fights, who build but never risk, then we must embrace those willing to risk defeat to find glory. Fury’s leap of faith is the latest of a thousand contradictions, a hundred switches of plot line in a chaotic career and yet another unexpected pivot that shunts the plates of the entire heavyweight division. Who ever emerges victorious from their encounter would hold a victory more significant than any Joshua currently holds and will, for many, establish themselves as ‘the man’ in the sport’s most lucrative division. Those around this incarnation of the Gypsy King have tried hard to offer wisdom and direction, to entreat Fury to a path of patience and caution. One senses Fury listens sometimes and not others, that he is respectful of the experience and sincerity behind the input and yet bored by the pragmatism. An instinctive and impulsive character Fury appears ever more congruent with his own needs, both physical and emotional and there is a stubbornness in him that Wilder will struggle to extinguish. It is also the most likely reason he said ‘Yes’ when all sporting convention and commercial common sense suggested patience and more fine-tuning were essential. Certainly, when the journey began Frank Warren, a cautious promoter by nature, insisted progress would be slow and spoke publicly of the need for three, four perhaps five fights before Fury could be considered ready for a challenge of this proportion. One can only speculate as to the reasons for the change of heart. Fury boredom? The temptation to secure leverage ahead of a Joshua negotiation or evidence behind closed doors that Fury is far more polished than Saturday’s performance suggests he is. There is opportunism at work in making this fight, enflamed a little further by the increasing acrimony between the promotional houses at work at the top end of the sport. Oneupmanship is poor foundation for business strategy but one few appear able to resist. Were Fury to reject this chance, and the prospect of both Joshua and Wilder being forced to fight a slew of mandatories and then perhaps each other, he could find himself off the heavyweight fairway for 2 years. I suspect Fury, and those around him, are also aware that as quickly as this current swell of motivation arrived, it could disappear again, and with it tens of millions of dollars. 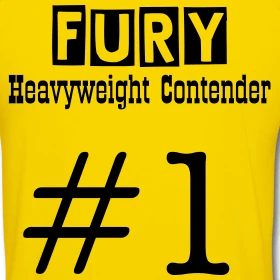 As an admirer of Fury’s I find it hard to be objective nor write off the former champion’s prospects in the bout but he is no longer the hardened professional of 2015. Whether that tone, timing and intent can be restored sufficiently before the year is out is impossible to determine. For all it will break my heart, on the evidence in the public domain, it seems highly unlikely.